Since buying Jack, I knew that eventually I would need to give up the ride on TC, since riding 3 horses (with Riley back in Raleigh) is more than I can manage longterm. 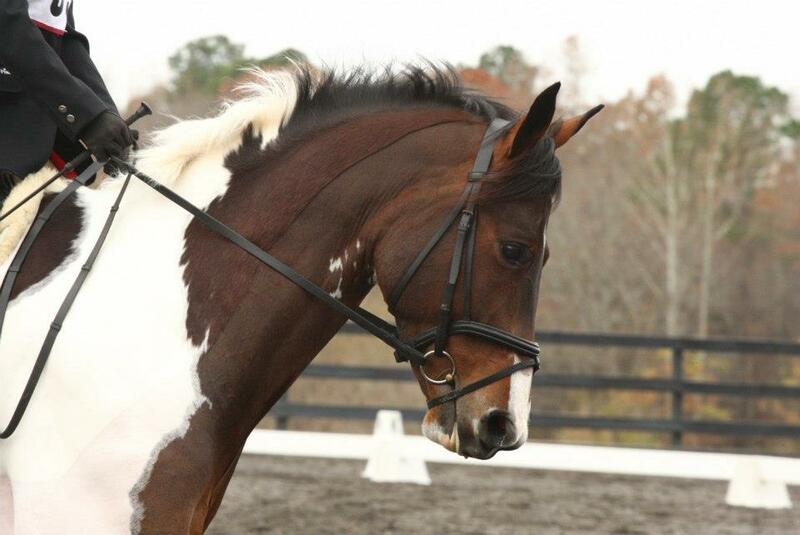 Because I also wanted to compete him one more time and improve on the last show’s experience, we determined that the Raleigh I/II dressage show would be our last hurrah before handing the reins over to someone else. On Saturday, we competed in Training 2 and 3, tests that we also competed in at the prior show. TC’s entire demeanor was that of a well-traveled show horse, not the 7 yr old at his second competition, and he was the consummate professional. Training 3 was our first test (why, oh why do they do the higher tests first?) and he warmed up beautifully. The test itself was fairly good, barring some spooking/looking at the water in one of the corners that turned into us almost leaving the arena in the next. Our only real bobble was in the canter, where for the first time TC did this fun thing where he got disunited, so I brought him back to a trot and picked up the lead again in time for the next movement, which was the downward trot transition across the diagonal. We got an unfortunate 4 for the break in canter, but that’s fair. Our test scored a 67%, earning us 4th out of 16 competitors. It’s of course frustrating to think that if we hadn’t broke in the canter that we could have maybe even won the class, but overall I was really pleased and surprised to earn that score. Training 2 was our afternoon ride, and even the in-laws turned out to witness dressage brilliance (kidding- Training 2 is a boring test at best). Luckily there was enough time to read the same judge’s comments from the morning, and learn from that feedback to make a plan for our second visit. Barring a little lookiness at the continuing standing water in the corner at A and scooting into the downward walk transition in the next corner, I am really happy with how the test went. The judge thought so too, and we finally broke 70% with a 72 for a pretty blue ribbon. Some big goals (for us) were met in this test. I was finally able to show off his good stretchy trot and get an 8 on that movement (where’s my coefficient at- boo!). 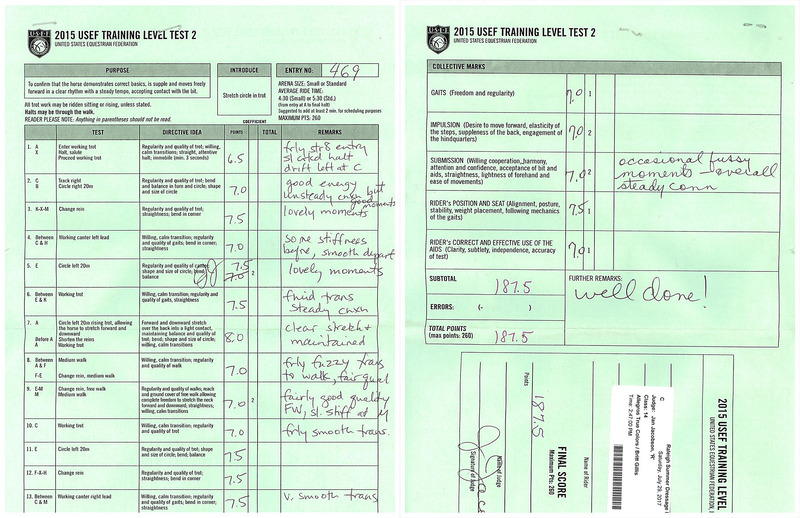 One of the goals I stated to my trainer before the show was also improving my rider score in the collection marks. Depending on where we are, I generally get a 6.5 or 7. So a 7.5 was a definitely step in the right direction, as I am finally getting the feel for where my elbows should live and keeping my hands closer together. Tomorrow, we look at TC’s first First level test! TC is so cute, and it looks like it was a pretty successful outing!